Having arrived in Sydney, Australia and sitting around struggling with jet lag for the first time in my life, Julia and I decided we needed to jump on a tour bus and do something. Disappointingly, I managed to take no decent photos of Sydney in the five days that we were there. 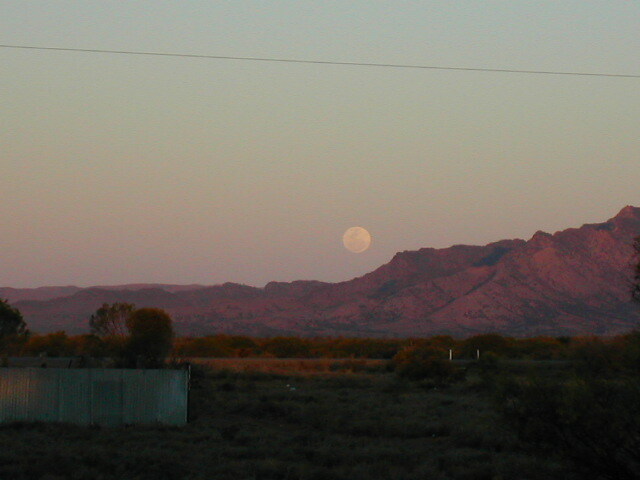 The images that follow kind of document our journey from Sydney to Alice Springs via Canberra, Melbourne and Adelaide. Looking back, I’m really narked that I only took this range of photos in 640×480 resolution. This is because I was concerned about using up my camera memory whilst being nowhere near an Internet cafe. Three years later, my mobile phone takes higher resolution images and has nearly as much memory! Oh, and it has video *with* sound. So, we jumped on the next Oz Experience bus out of Sydney. 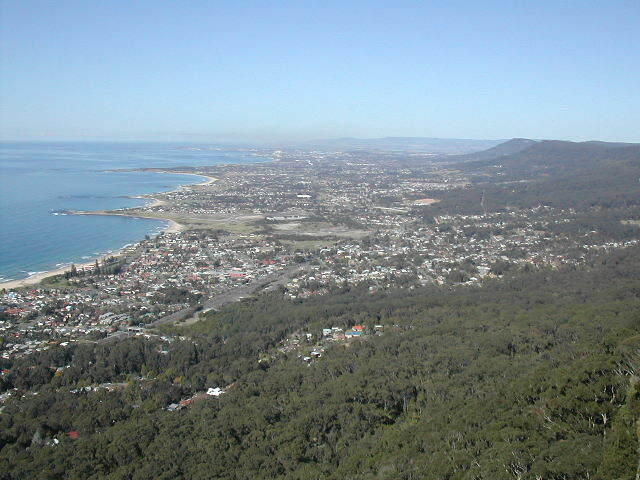 As I recall, the first stop was at this lookout over Wollongong, just south of Sydney. Marvellous. Murramarang National Park is at the most southern point of New South Wales. These were the first kangaroos we saw. We’d soon get sick of them, but at this stage they were a novelty. 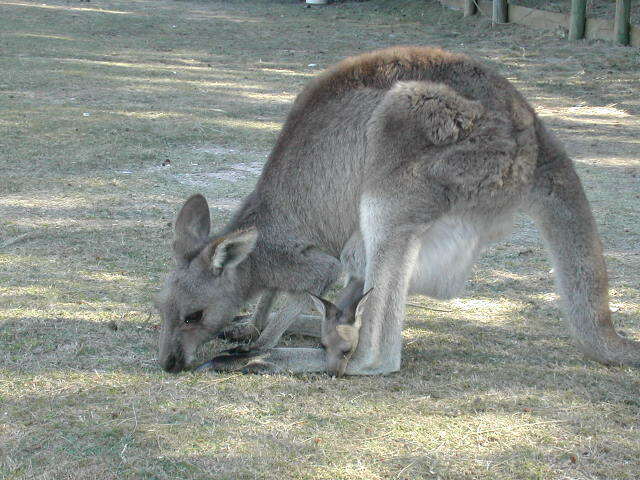 I guess the joeys were cute, though. Ahhh, look at this one everyone. 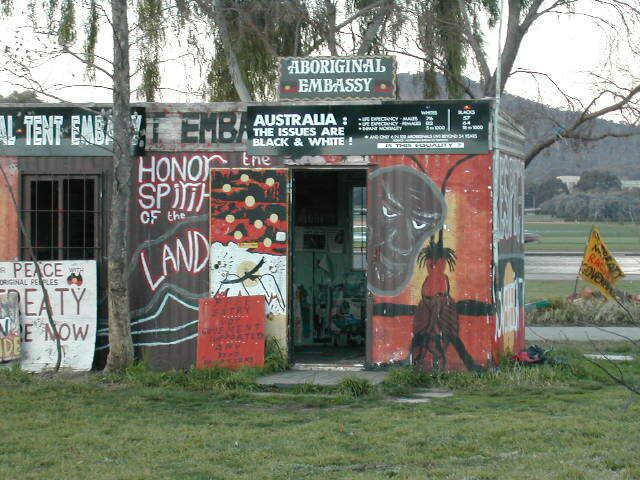 The Aboriginal Tent Embassy in Canberra was first erected in 1972 following a federal ruling that rejected Aboriginal land rights. The site is on the lawn opposite the old Australian Parliament. It is still not recognised as an official embassy by the Australian Government. I still haven’t made up my mind about the whole Aborigine situation in Australia. Unfortunately, whilst there are some positive Aboriginal community projects, most of my aboriginal experiences were negative, which possibly explains the stance taken by many white Australians. 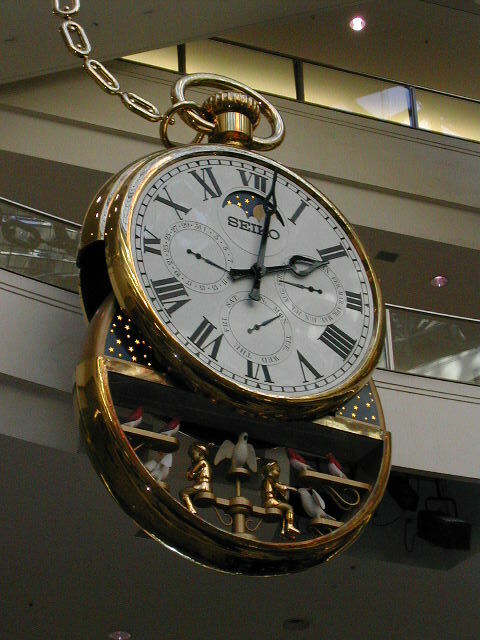 This giant fob watch was quite an attraction. On the hour, the interior of the watch would gradually lower whilst playing ‘Waltzing Matilda’ and putting on a clockwork display. Just behind this is the historic Shot Tower. It is a protected building, so when Melbourne Central Shopping Centre was built they simply built around it and created a huge glass dome over it. Shot towers were built to create lead shot. By releasing small drops of molten lead from the top into a cooling vat of water at the bottom they solidified into perfect spheres and were then sold as bullets. 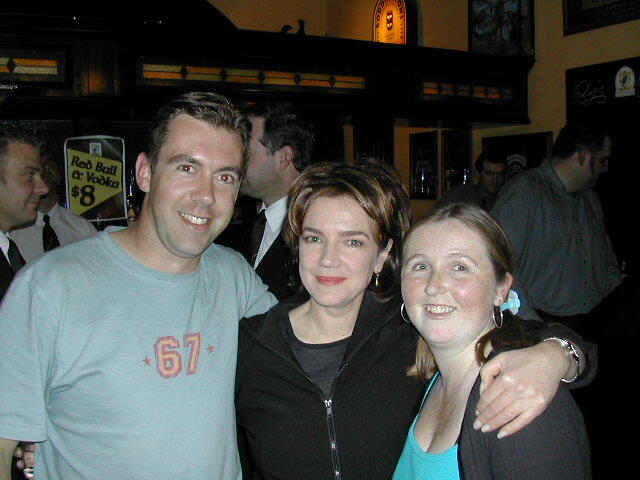 It’s Neighbours Night at the Elephant & Wheelbarrow Pub in St Kilda, Melbourne and this is us with Lyn Scully. We were very, very drunk. 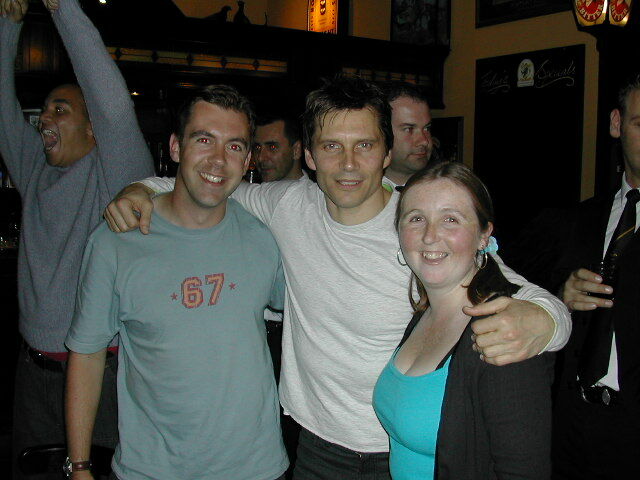 Actually, we don’t look as drunk as we really were. But you ask Lyn Scully’s actress, she’ll tell you that we were drunk. 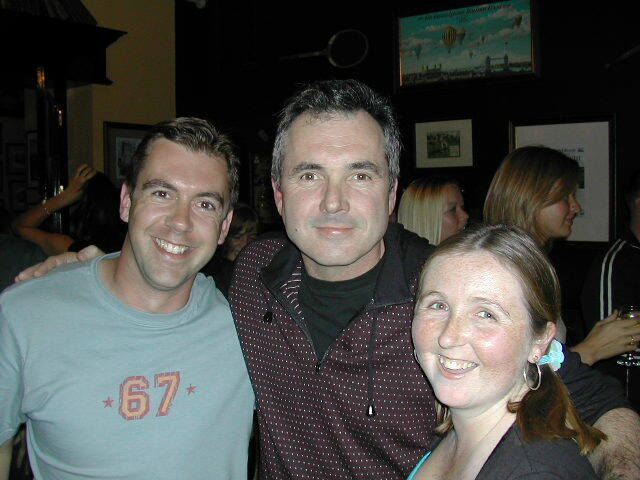 Ditto Karl Kennedy. Ditto Karl Kennedy’s actor, ditto. You get the idea, though I reckon we’d had more sleep than him. He’s Darcy Tyler by the way. The following day was Julia’s birthday and what a treat it was! We joined a trip to ‘Ramsey Street’ the home of ‘Neighbours’. It’s actually a real cul-de-sac where Victorians (not the sort with top hats and sideburns from the 19th century, but people from the state of Victoria) live. They have a night security guard and earn some extra cash by allowing filming to take place in the street. No filming takes place inside these houses. Anyway, we caught a snippet of live action between Harold and Lou and some lady with white hair (I don’t know, I don’t really watch it any more). Harold, being a proper gentleman, popped to let us take photos with him between takes. Julia even got a birthday kiss. Hooray! Lou didn’t even come over. Boooooo! 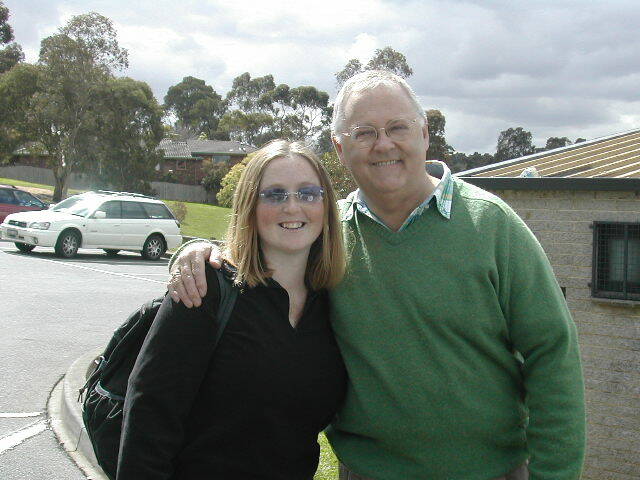 Incidentally, this image is being used by someone on Facebook calling themselves Harold Bishop. I suspect that the account owner is phishing for personal info, so don’t add him as a friend. Edit: He has since accepted my Friend Request, seen my message, unfriended me and changed the profile image (or deleted the account, I can’t tell which). 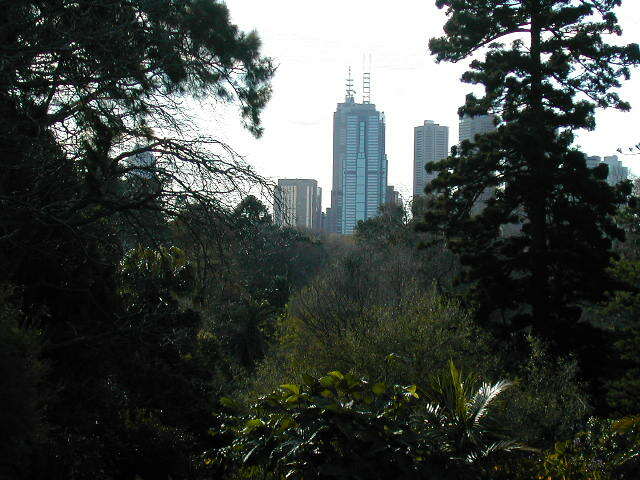 Part of the CBD framed by trees in Royal Botanic Gardens, Melbourne. I liked the contrast in this image. 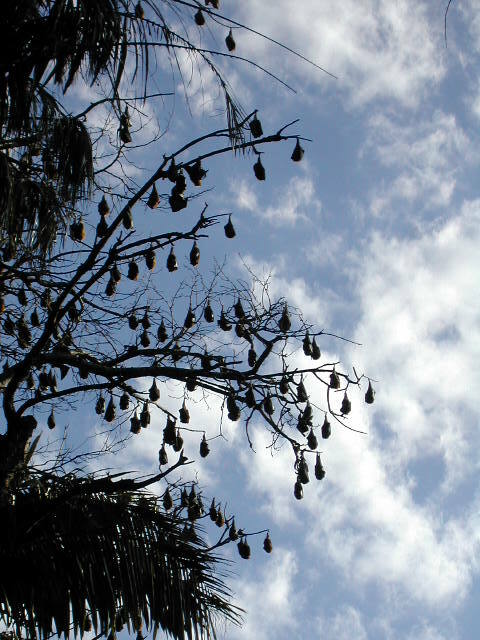 Whilst the grey-headed flying foxes (bats) made interesting viewing in Royal Botanic Gardens, Melbourne, the sad story was that they were stripping trees bare. They also had acid droppings, just like the bile in the Alien films. I may have exaggerated that last bit, but we were advised to avoid walking under the trees. 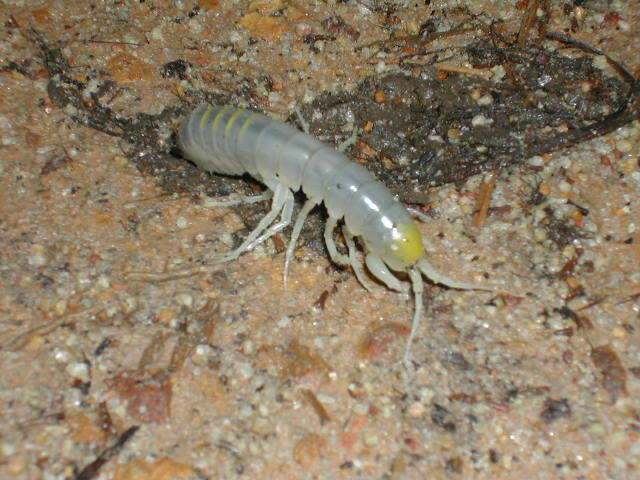 I found this awkward-looking shrimp-like creature in the middle of a path in Grampians National Park. Having never seen anything like it on land before, I decided to do a little research. Many thanks to Gary and to Daniel Dobrosak of The Entomological Society of Victoria Inc. for forwarding my request for info to Gary Poore. 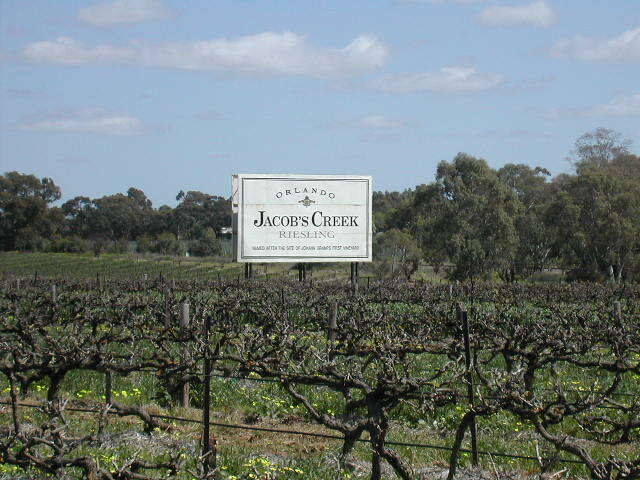 Regardless of what you think of Riesling, here is where Jacobs Creek grow theirs. Parachilna, South Australia is nearly a ghost town. A remnant of the railway era, it now (2002) has a permanent population of seven. However, it still has a hotel. The main event of our stay there was to watch the daily coal train pass. It is about 3km long and takes about five minutes to pass. It got kind of boring after the first minute or so. Coober Pedy is the opal mining capital of the world, or at least, that’s its reputation. The town is characterised by the fact that many people live underground, in converted mines, to avoid the scorching daytime heat. 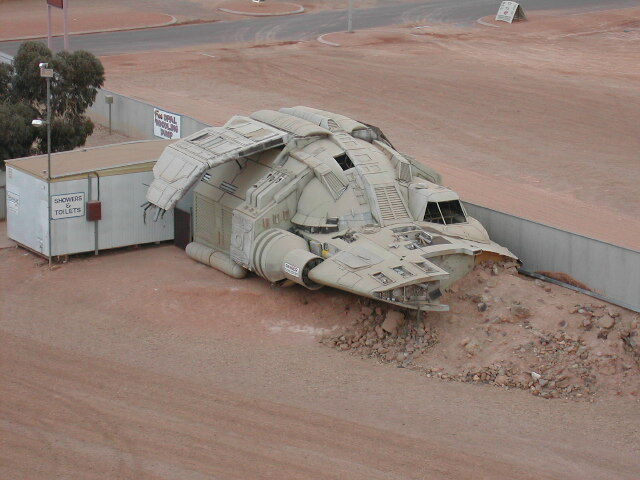 Pictured here is the ship used in the film Pitch Black spaceship, which was filmed in Coober Pedy. 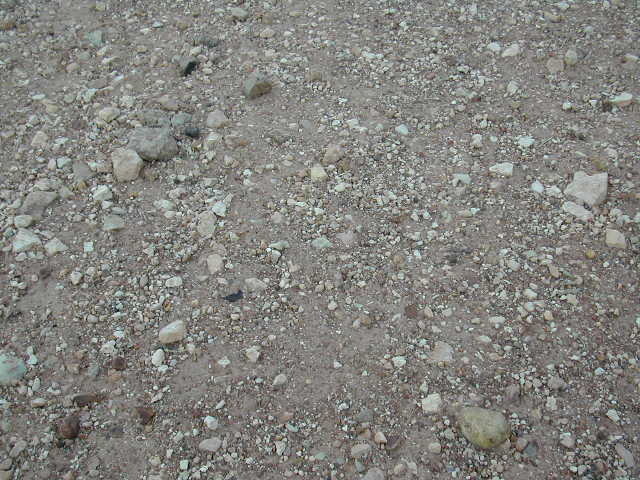 Whilst most team contact sports, including Australian Rules Football, are played on the relative safety of grass, the Coober Pedy Aussie Rules team play on this. 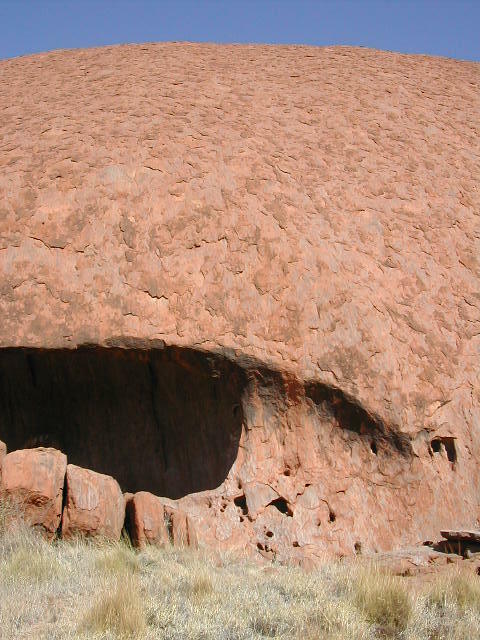 Uluru is the Aboriginal name for Ayer’s Rock and this is what it looks like close up. The red colouring comes from oxidised iron. 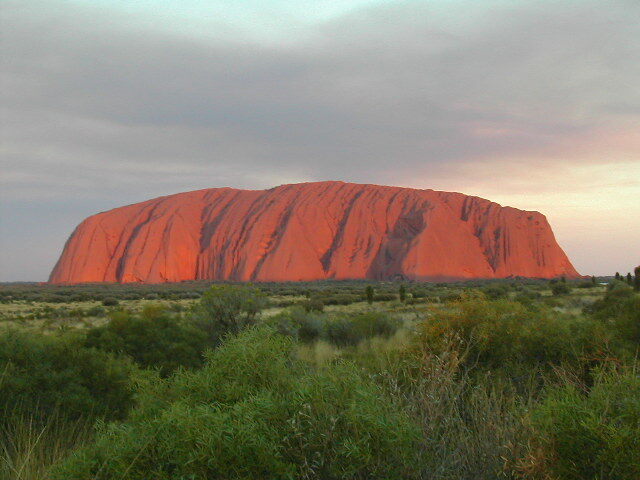 This is the classic view of Uluru. The shades of red change considerably through the duration of the sunset. 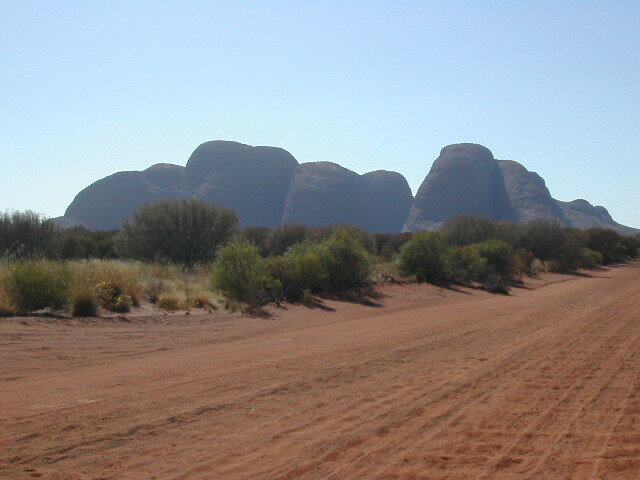 Kata Tjuta is in the same family of rock formation as Uluru. 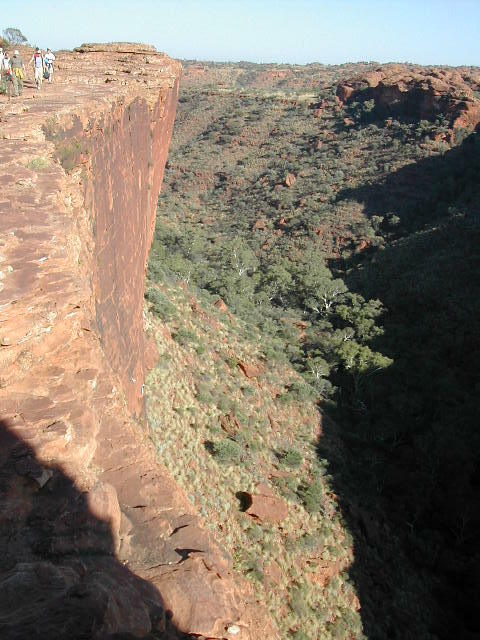 However, wind erosion has had a greater impact here and Kata Tjuta is consequently formed by many different peaks instead of just the one. 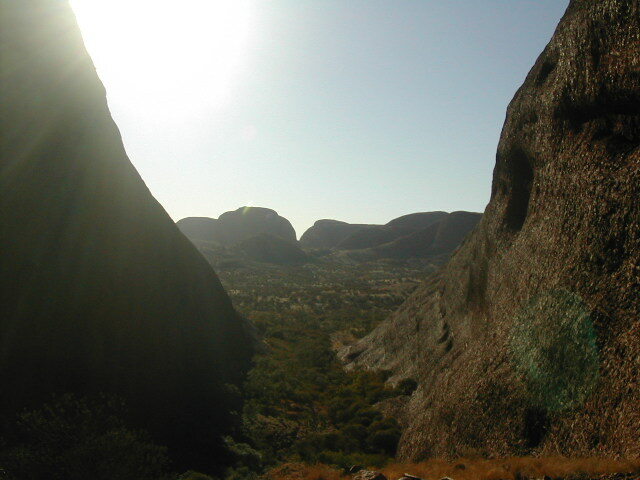 Our tour group got up early to watch sunrise hit Kata Tjuta, a similar effect to that witnessed at Uluru, but perhaps more stunning as we were in the midst of the mounts. We then trekked uphill through the Valley of the Winds, which were aptly named. It was a hard slog as the oncoming wind was channelled through the valley, thus increasing the velocity.